The northern lights are a quintessential bucket list item. Seeing the impressive display swirling overhead while you kick back is an incredible experience. Fortunately, many people in the United States may have the rare opportunity to see the display right outside their home the night of October 7 into the morning of October 8. 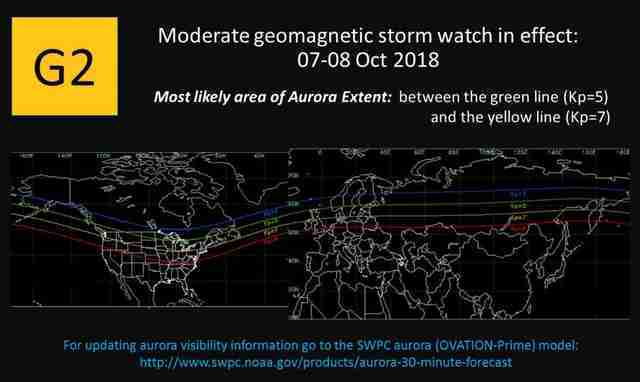 The Space Weather Prediction Center (SWPC) has put out an alert for a G2 level moderate geomagnetic storm, due to a "positive polarity coronal hole high-speed stream." The important part for stargazers is that the event can supercharge the aurora and make it appear much further south than you'd usually be able to see it. In fact, a G2 storm can bring the aurora as far south as northern Illinois. The yellow line in the map above from the SWPC shows the southern edge of where you might catch the colorful display. The area includes (from west to east) Washington, Idaho, Montana, Wyoming, North Dakota, South Dakota, Minnesota, Iowa, Wisconsin, Illinois, Michigan, Indiana, Ohio, Pennsylvania, New York, Massachusetts, New Hampshire, Vermont, and Maine. (Also, Alaska, of course, but the aurora isn't uncommon there.) If you're in Canada, you're in good shape. Per the SWPC's 3-Day Forecast, the G2 alert is in effect from 5pm ET until 11pm ET. On either side of that, there's a G1 alert, which has a smaller area that is likely to see the aurora. Though, that area still reaches into the United States. (As far south as the green line in the map above.) The G1 alert will run from 11pm until 5am ET. Though it seems like it should be no more complicated than stepping outside and looking up, it's not always so simple to see the aurora borealis. For starters, it's best to get far from urban centers where light pollution can impede your ability to see the northern lights. Additionally, as an SWPC representative previously told Thrillist, "You need very clear skies, a good view of the northern horizon (no trees, buildings or hills), and it needs to be dark." 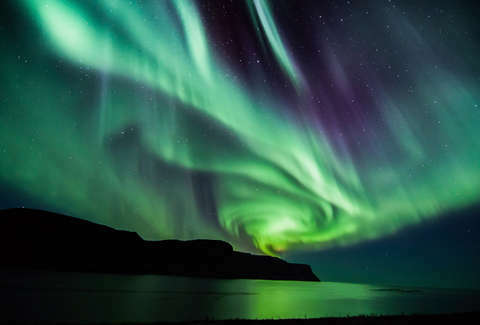 Unless you're in Iceland, Alaska or other northern locales that frequently see the aurora, you'll probably have to look along the northern horizon to see the lights. In situations like this, it's rare that they'll cover the sky over your head as you see in pictures from Scandinavian countries. You may have seen alerts like this on Thrillist before because solar storms happen from time to time, but it's not a common situation. Not only is the event uncommon, but the storm aligning with you being in the right place with the right weather means that you should take advantage of the opportunity when you have it. That's especially true since we're close to the solar minimum in the solar cycle, which makes it less likely for the situation to arise in locations as far south as the contiguous United States. So, pack up some hot chocolate and a snack and get out there.